ALTRISET is the most technically advanced termite solution available today which is why your pest controller has recommended it for you. When it comes to termite control, you need a proven product that delivers powerful control, which is why ALTRISET is fast becoming the new alternative in termite protection. Has very low toxicity to mammals, birds, earthworms and even bees. ALTRISET stops termites feeding within 2 to 4 hours so you can be reassured there will be no further damage to the home. ALTRISET kills 100% of directly or indirectly exposed termites in 14 days. ALTRISET is transferred readily from donor termites (those exposed to termiticide) to recipient termites (those not exposed to termiticide). This results in 100% mortality of all termites within 14 days. Source: Stine-Haskell Research (DuPont). R. virginicus. ALTRISET Termiticide was challenged under field trial protocols in a trial in Gosford, NSW. It performed powerfully, with both high and low doses delivering 100% protection in horizontal and vertical treatments after 8 years. The ALTRISET registered label approved by the APVMA currently has a claim of up to 8 years protection, south of the Tropic of Capricorn. ALTRISET has excellent transfer properties, which helps destroy termite colonies and provides lasting protection. Once exposed to ALTRISET, termites become paralysed and do not die for several days, this allows unexposed nest mates to aggregate and groom with the ALTRISET affected termites thus transferring it further among other colony members. The chemical treated zone forms a protective area that continues to reduce termite numbers as they get in contact with the treated zone around the property, safeguarding it for years to come. ALTRISET is the only liquid termite treatment in Australia that is exempt from poison scheduling, which means less risk for pest controllers, homeowners and the environment. ALTRISET is designed for use inside and outside all structures and given it is exempt from poison scheduling it is the ideal product to use in confined spaces such as subfloors. Protective Personal Equipment is not required with ALTRISET and no odour and skin irritation means an improved experience for the applicator and less disruption to the homeowner. The unique, targeted mode of action results in very low toxicity to mammals, birds, fish, earthworms and even bees. This is because only certain insect muscles are sensitive to and targeted by, its activity. So while ALTRISET is tough on termites, it’s gentle on people, pets and the environment. There are many termiticide products, all claiming effective control. But they all work in different ways, contain different ingredients, and have different attributes to consider. ALTRISET uses innovative chemistry that takes its inspiration from nature. 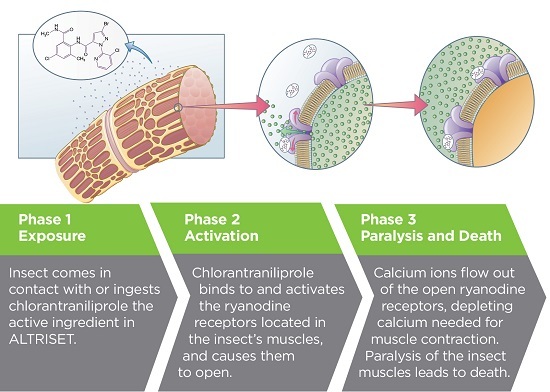 Chlorantraniliprole, the active ingredient in ALTRISET, mirrors the insecticidal properties of a substance found in the South American trees and shrubs of Ryania spp. Studies have proven that ALTRISET is highly effective against termites, stopping them feeding within hours, which prevents any further damage to the property that is infested. Laboratory tests have shown that termites tunnel through the treated zone and quickly acquire a lethal dose of ALTRISET. 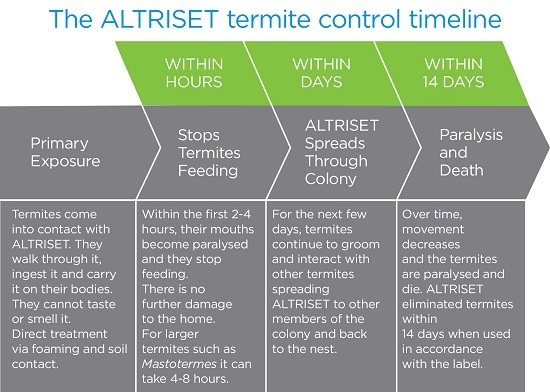 Once affected by ALTRISET, termites will begin to exhibit increased aggregation, enhanced grooming and contact with other colony members for hours. Affected termites will become more lethargic and show signs of muscle paralysis; decreased coordination and mortality will ultimately occur within several days. The delayed mortality and increased colony interaction are key reasons why ALTRISET is so effective.